IN STOCK. Includes the clock, carrying strap, 15 stations, and a box of report tape. All metal frame, solid watchman clock. Yes, it is in stock, as are extra report tapes. Tape report is easy to read, easy to store. It's not heavy. Weighs about 2 lbs. 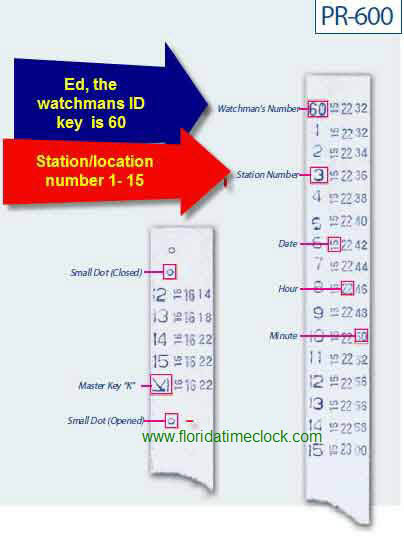 At each checkpoint, your security guard takes the station numbered key out of the station box, inserts it into the recorder and turns it clockwise to record the checking time. This produces a hard copy report which includes the station number, date, hour and minute for each check point visited. When finished at the station, the guard simply returns the key to the station box and goes to the next check point. To maintain the integrity of the patrol record, access to the record tape and time adjustment can only be achieved with use of a master key. Thus, whenever the recorder is opened with the master key, the letter "K" will appear-on the tape. Every time the recorder is opened or closed, a small "o" will appear on the tape, showing the time and place that the recorder was opened. As an added security measure, those companies who rotate patrol courses can require that each watchman register his/her I.D. number on the record tape at the beginning of each route. A self-contained cell battery provides you with months of maintenance free use, requiring no need for regular winding on your part. In addition, the battery indicator light on the clock face will disappear to alert you to replace the battery. Weighing less than two pounds, the PR-600 is lightweight and easy to carry. As light as it is, the recorder is designed for maximum protection against possible mishandling. The inside is all metal. With up to 99 station keys available from the recorder, the PR-600 can be customized to meet the exact needs of your facility and patrol schedule. 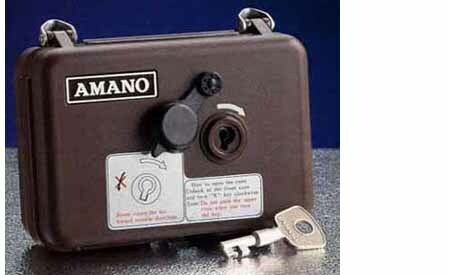 To prevent the loss of station keys, a locking station key box is optional.